Plant maintenance operations are a necessity to maintain and secure production capacity. They usually imply a temporary reduction in production output which makes maintenance efficiency an important factor in many industries. 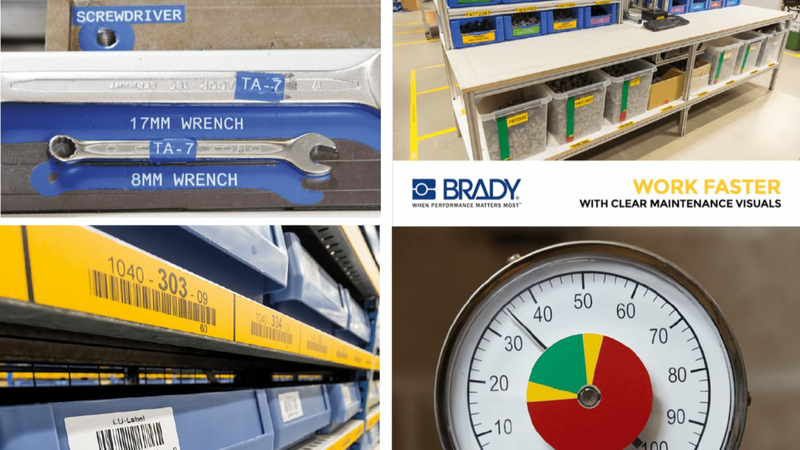 With reliable signs and labels, and on-site design and printing capabilities, Brady Corporation offers a solution that can significantly increase the efficiency of maintenance operations. With reliable and highly customisable signs and labels, maintenance attention points on machinery can be clearly marked, equipment can easily be identified and signs can indicate which areas are included in upcoming maintenance projects. Brady's signs and visuals can also be used to provide work instructions where they matter most, so every maintenance professional knows exactly what to do, where it needs to be done, which tools to use and where these can be found. By including a professional Brady label printer in the maintenance tool set, almost any maintenance visual is immediately available. Impactful self-adhesive and magnetic signs, labels and work instructions can be printed on-site and on demand, even while maintenance is ongoing. Simply insert a label consumable in the printer, design it with Brady Workstation apps, print and apply without any hassle or waiting for sign or label deliveries. Printer label consumables are available in a great variety of sizes, shapes and colours to cover every maintenance identification application. Depending on the printer model, they can be printed in black, in colour and even cut to shape to be applied on gauge meters, oddly shaped machine components and tools. The self-adhesive labels and signs can be offered with permanent or removable adhesives, and with magnetic strips to cover even more applications in facilities. See applied maintenance visuals on the Brady website.